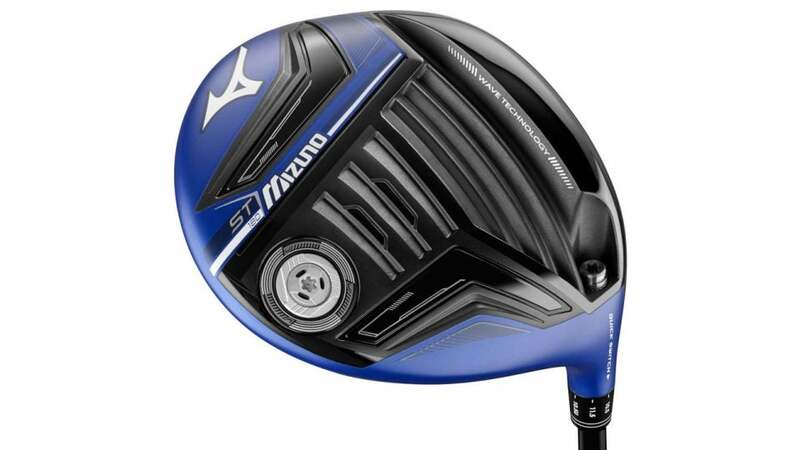 The new Mizuno ST180 driver. SPECS: 9.5°, 12.5° (adjustable +/-2°) with Mitsubishi Tensei Orange, Tensei Blue, or Bassara graphite shafts. RECOMMENDATION: Targets mid- to high-handicaps looking for a higher-launching driver with good spin and distance characteristics. KEY TECHNOLOGIES: Ridged sole geometry adds spring at impact for hotter ball speeds across more of the face; CORTECH optimizes thicknesses across the SP700 titanium face to maximize the sweet spot; a waffle pattern on the underside of the crown saves weight for a lower CG and improved launch. How do you make a club forgiving enough for high-handicappers but with a low-spin profile that meets the needs of stronger swingers? For Mizuno, the answer's simple: Ride the wave. The ST180 imports the "wave" sole from the company's fairway woods and hybrids, which not only flexes more than a standard shape, but also saves weight. The waffle crown lightens things up, too, allowing engineers to reposition mass to amp-up MOI while also shaving spin. Add in a high-end SP-700 titanium alloy face and you're looking at a driver that can produce hot results across a wide area for all types of players. "Ticks all the boxes as far as forgiveness, pop, and launch. Very forgiving, with good adjustability. A great option for players who want to improve in all performance areas. "